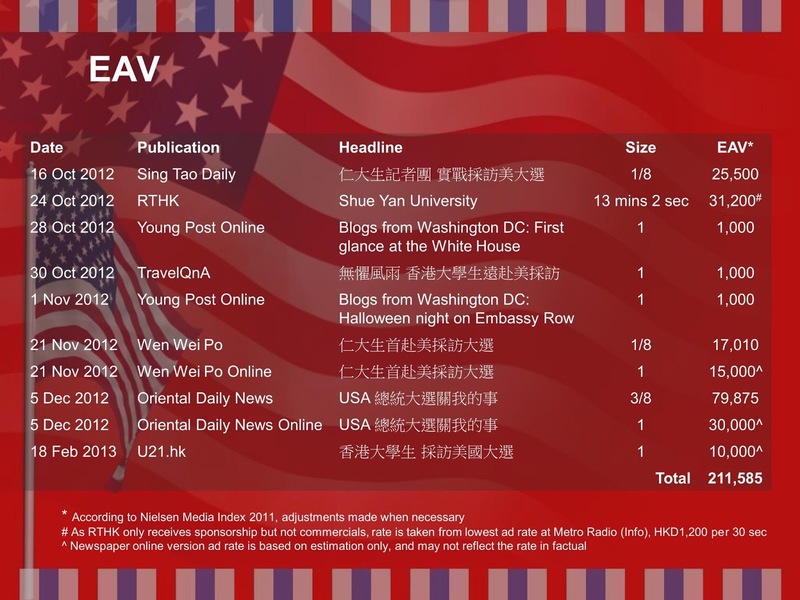 The following is the coverage summary of the news generated based on HKSYU U.S. Presidential Election Reporting Trip 2012. Ten coverage that approximately equivalent to HKD 211k advertising value was generated. For full coverage report, please visit here. HONG KONG, November 19 --- Students from Hong Kong Shue Yan University’s Department of Journalism and Mass Communication covered U.S. Presidential Election 2012 in Washington, D.C. for the very first time in the history of Hong Kong education. 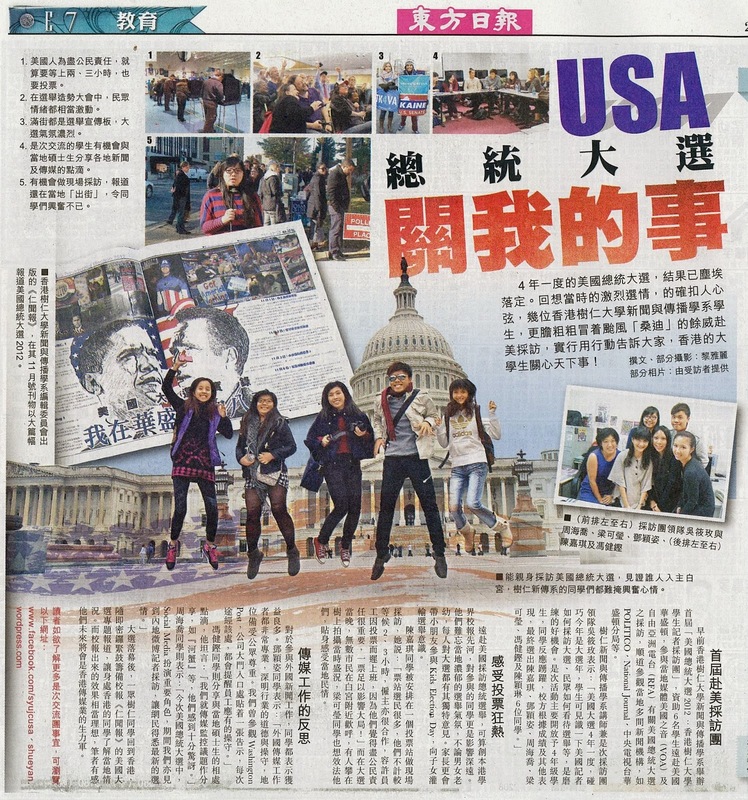 Earlier this month, Hong Kong Shue Yan University’s Department of Journalism and Mass Communication sponsored six students to go to Washington, D.C. to cover stories on U.S. Presidential Election 2012, as well as to carry out cultural exchange with local universities. The trip, namely “The U.S. Presidential Election 2012: HKSYU Student Journalist Educational Reporting Trip" was a first of its’ kind for the University. Students observed senior journalists at news organizations including the Voice of America and Radio Free Asia, and also actively covered the Election for the student media through social media. “The six students have created around a maximum of 10,000 weekly reach on the trip’s Facebook page and have accumulated nearly 2,000 views on their WordPress within two weeks, they have done a great job in utilizing the power of social media to reach out more audience, we are proud of their work”, said Professor Leung Tin-Wai, Head of Department of Journalism and Mass Communication, Hong Kong Shue Yan University. “Apart from simply text and pictures, we used multimedia elements and distributed our reporting via various channels including print and online media. This is a great opportunity for us to create integrated reporting on such an influential political event”, said Phoebe Chau, Executive Editor of Our Voice (the University’s student newspaper) and one of the participants of the trip. Participants also visited various prestigious leading media outlets including The Washington Post, The New York Times, National Journal, CCTV as well as National Public Radio, and have visited Georgetown University and American University for cultural exchange. The trip helped students to gain valuable experience in reporting overseas, and encouraged young and aspiring journalists in Hong Kong to better understand foreign culture and international affairs. 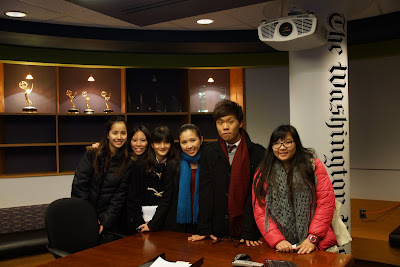 During their two week trip to the U.S, Shue Yan journalism students visited various media outlets including two Pulitzer-Prize winning newspapers. The students observed the differences and similarities between the American and Hong Kong media. The first visit was to The Washington Post is best known for its investigative stories since reporters Bob Woodward and Carl Bernstein led the investigation Watergate scandal that greatly contributed to President Richard Nixon’s resignation in the 70s. is working on the coverage for the election. “The investigative team works on long-term projects; they spend a lot of time going through documents, peeling back what’s happening in different government agencies, to see if all of the dots are lining up and if there appears to be anything a little bit off, then they start hunting to take some time and ask some questions to figure out what’s going on,” said Alma Gill, who works at The Washington Post. “Jeff Leen (assistant managing editor of The Post’s investigations unit) always says the smallest thing can turn into the biggest story because most people will overlook a very small issue, when usually that’s the beginning of the story,” said Gill. It is a very common practice for the U.S. media to have a code of ethics, which is usually distributed to every reporter who joins the media. In The Washington Post, journalists are very conscious about the accuracy of their print reporting. “It needs to be checked by a copy editor to make sure that is exactly what you are printing,” said Gill. The third largest newspaper in the States, The New York Times, also demonstrated how much it treasures journalistic ethics as well as in-depth and investigative reporting. This could be spotted easily from the way they cover the presidential election. and highest achievements in journalism. “We are looking at money stories, anything unconscionable about the money, as it is important to these campaigns; each of them will spend about a billion dollars on each side. We looked at the big donors, big donors from Macau gambling in LA, should they have poured in quite a bit of money in after primary for Romney, that’s been a huge story for us,” said Apcar. Apcar said The New York Times traditionally had been in-depth in covering the election,“We have done long pieces, and daily reporting on these big issues, such as bailouts, Ohio voters, housing policies, banking policies,” he said. “I would like The New York Times, both online and in print, to be authoritative. You can Google healthcare policy, Obama, Romney, and I’d like you to go to our stuff as it was probably more thorough, more authoritative,” said Apcar. As these award-winning newspapers work on their reporting, it is obvious that they would like to maintain their journalistic principles as well as their credibility. We met Judith Ritter at the landmark restaurant Ben’s Chili Bowl in the Shaw neighborhood in northwest D.C., which is also a significant place for the civil rights movement and a historically African-American neighborhood. Ritter, a former McGill University professor and now a freelance journalist and producer based in Montreal, Canada, is a volunteer for Obama’s campaign this year. She volunteers out of the Virginia office and started in September. She’s no newbie when it comes to campaign volunteering. In Obama’s 2008 campaign four years ago she walked house to house, knocking on doors. This time she’s working the phones and sharing her views with young journalists such as ourselves. “I’m like a worker bee … but I think every single thing I do matters, and I hope what I can do helps in the campaign, ” says Ritter amidst the back chatter of a packed Ben’s Chili Bowl. Her experience as a journalist has helped the campaign too, especially when it comes to training fellow volunteers. She teaches them the art of making campaign calls and shares persuasion techniques. Ritter soon headed back to Canada where she will watch the results from afar. Although she can’t be certain her tactics will get Obama elected, she said she loved the camaraderie of the volunteer community. Our Voice reporters, Phoebe Chau, Ryan Fung, Edith Leung, Jennifer Tang, Wendy Chan and Karen Chan, caught up with various media. In the age of Google, Facebook and blogs, the media competition for the audience is fierce, especially during a major event such as a presidential election. Just days before the 2012 U.S. Presidential Election we met with several top news organizations in the U.S. to ask them how they geared up for the big day. Q: How do you use social media to cover the election? When social media first became big, people use it just to push out contacts. But now you have to engage to your audience and create a sense of a community. So now we interact with them a lot. We also see it as a news gathering tool, like if there is a rally, we may ask what they think about it, and ask them to send us photos and videos. We have all these people out there to help us, and we have to utilize them, as they will be the first people to arrive at the scene. Q: How will you cover this Election? We have Studio 4A set up to cover the Presidential Election, so next Tuesday (November 6) there will be reporters, correspondents, staff, digital service people, bloggers and others at all these different tables around the room. Everyone monitoring either feeds from different states or results from the other networks and, international and national broadcasters reporting things if CNN has information we don’t. We are looking at how diversity in America is changing policies and politics. As an election challenge, we are now trying to build charts and maps, looking at pretty exclusively people of color who are running for Congress. That’s going to show us over time how our nation is becoming much more a melting pot, balancing the minority and majority. As I arrived at 330 Independence Avenue Southwest, Washington, D.C., I said to myself, “this is the place where I am going to have a short internship”. After the security check and taking the escalator to the second floor, I stepped in to the Voice of America’s Chinese branch. It was extraordinary, as I had fl own all the way from Hong Kong to D.C. Thanks to HKSYU‘s journalism department, I was able to have a short internship, with this government funded multimedia broadcaster. VOA is different from newsrooms in Hong Kong. People here are more diversified, and are given more freedom to complete their tasks, as well as pitching story ideas. I was responsible for managing social media, helping to promote programs to their target audience: people in China The most unforgettable moment would be November 6 – election night. I followed an experienced reporter all the way to Richmond, Virginia, to observe the Democrats’ party. I witnessed Barack Obama’s victory, as well as the passion of Americans in politics. This experience has inspired me to pursue a career overseas. As journalism students in Hong Kong, we haven’t had the chance to see inside a foreign newsroom. 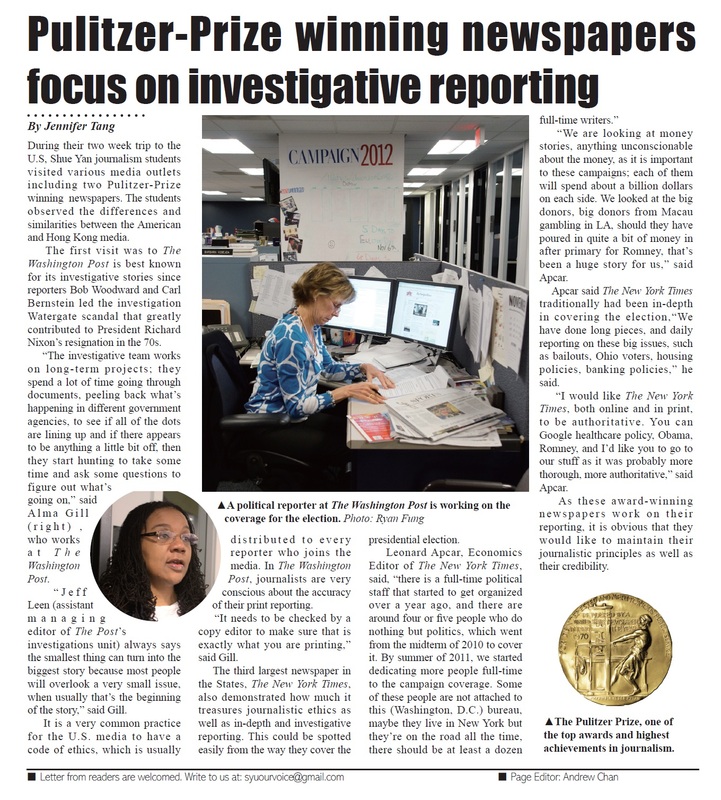 That changed on Thursday morning, when we were very lucky to get a glimpse inside The Washington Post, and see how this Pulitzer Prize-winning newspaper operates. First, we observed that the working hours of a U.S. newsroom is quite different from those in Hong Kong. Staff at The Washington Post start very early in the morning (many of them at 9 am), and typically get off work at around 6:30 pm on a usual day. This is not atypical of media in the U.S. Journalists in Hong Kong usually start in the afternoon and stay until midnight, which is when stories are completed and the newspaper is ready to go to print. Although the media in the U.S. and Hong Kong are both moving towards digitalization, they are doing so very differently. 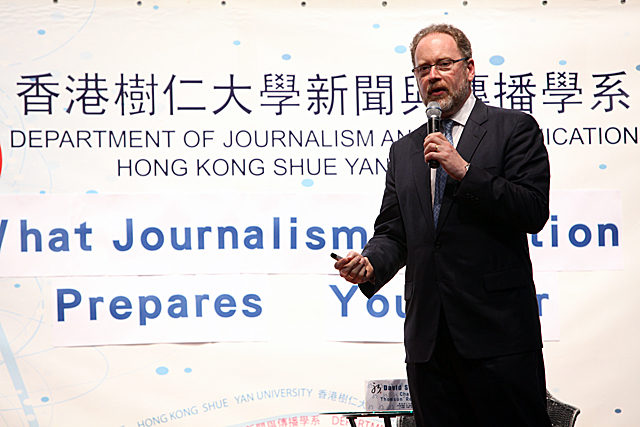 Hong Kong newspapers are moving online and incorporating more multimedia elements such as video to their reporting, but most of the newspapers don’t have their own studio and produce their own programs. In contrast, The Washington Post has their own studio for recording short videos and programs. They even have a team that specializes and focuses on social media. Impressive stuff. “We also use it as a news gathering tool, so a lot of our reporters will tell readers, ‘If you are at a certain place, tell us what you were thinking, send us photos and videos.’ Now we have all these readers who help us (provide content), and we are going to utilize this (material) and be the first people to publish it,” Crum said. The visit to The Washington Post was an eye-opening experience. I came away thinking that the media in the U.S. is overall more sophisticated, and they are serious about moving from the paper/traditional media to digital. We are quite used to typhoons in Hong Kong, but we have never experienced a “Frankenstorm” or “superstorm” like Sandy before. And, truthfully, we feel it’s a bit unfortunate that the storm is coming to Washington, D.C., after we traveled all the way from Hong Kong. Still, we are treating this as a sort of extraordinary experience for us all. The Metro and other public transit are closed, so are schools, and federal government services. It seems like the situation is pretty bad. Before things got worse, we rushed to McDonald’s to grab some food. After, we walked to the CVS pharmacy, and that’s when we experienced the strength and power of Sandy. Heavy rainfall, strong winds, falling leaves, trees being taken down etc — that’s the power of what some in the media call the Frankenstorm. Some of our umbrellas even broke in the storm. It’s a pity we cannot do much under such a situation, but hopefully the storm will soon be gone, and fine weather will return so that we go back to election-related stories. During Flight UA862 from Hong Kong to San Francisco on October 27, I met an Indian-American businessman. He and his family are immigrants. He has been living in San Francisco for over 17 years, and his brother is living in New Jersey. We started chatting for a bit. It was quite interesting to get his viewpoints on the U.S. presidential election. “Two of my colleagues are Democrats, and one ended up voting for President Obama while the other one voted for Romney,” he said. “Why would your colleague who is a Democrat vote for Romney?” I asked. “You know what? Sometimes people participate in those party activities, and during the activities the party people ask you to do so and so, or not to do so and so. However, in this kind of situation, it will upset their supporters as well. My colleague participated in these kind of activities, and what the people in the Democratic Party asked him to do upset him. That’s why he didn’t vote for President Obama,” he explained. As our conversation went on, I asked who is he going to vote for, and why would he make such a choice. He said he is still undecided, and he will have to go through all the news on the presidential election to acquire more knowledge and updates. “In the U.S. the media has their own stance. It is somewhat clear that some media lean Republican and some media are Democratic.Therefore, I wouldn’t just read the news from a particular media. I will try to Google the news, and try to read as many as possible. The news there are from different media, so I would have a better idea on what’s going on,” he said. “Especially if you look into those reviews or comments below the news articles. Some of them support the Republicans, and some of them support the Democrats. It would then be easier for me to identify what side the media supports as well,” he said. It was interesting to have such a conversation even before we started the trip, which gave me a glimpse of how Americans view this presidential election. I am certainly looking forward to have more conversations with ordinary Americans as a way of cultural exchange. HONG KONG, October 15 --- Hong Kong Shue Yan University’s Department of Journalism and Mass Communication has organized its first U.S. reporting trip, “The U.S. Presidential Election 2012: HKSYU Student Journalist Educational Reporting Trip." The University is sponsoring six students to go to Washington D.C. to cover the U.S. Presidential Elections 2012. The students will be observing senior journalists at news organizations including the Voice of America and Radio Free Asia, and will also be visiting leading news outlets such as Politico, The National Journal and CCTV. Visit local media including National Public Radio, Politico, National Journal, CCTV Washington DC Bureau etc. This piece has won the Best in News Writing Merit in the First Annul Campus Newspapers Contest held by China Daily Hong Kong. 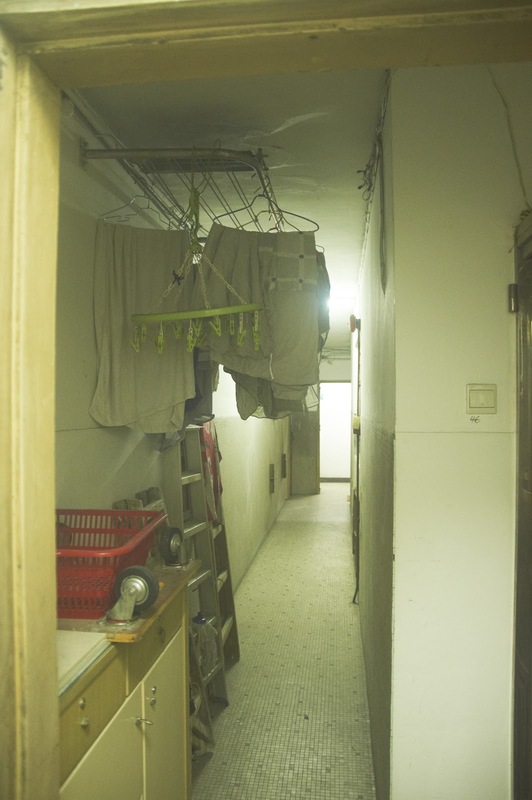 My journey into the underworld of illegal guesthouses in Hong Kong begins at Man Wah Sun Chuen, a private housing estate built in the 1960s in Jordan, Kowloon. I am meeting Teresita – an employee of Hong Kong Suite Apartment, a company that leases out short-term accommodation in Hong Kong and Taiwan – who greets me before taking me to the 18th floor of the Man King Building. As the lift only goes to the 16th floor, we have to walk up the stairs, which are littered with dead insects. When she opens the gates there are two doors, which means it is subdivided into two flats. She hands me the key, I open a door, and I find myself inside a suspected unlicensed guesthouse. Man Wah Sun Chuen is among a growing number of suspected unlicensed guesthouses, where property owners rent flats daily without a license issued by the Office of the Licensing Authority (OLA) under the Home Affairs Department. Business is seeing an uptick with the influx of visitors from mainland China and the rising number of expectant mainland mothers. According to the Tourism Commission, in 2011 Hong Kong received a record-high 42 million visitors from around the world, an increase of 16.4 per cent over 2010. And mainland visitors account for 67 per cent of all arrivals. Statistics from the Office of the Licensing Authority show that 427 premises were involved in the complaints received on suspected unlicensed guesthouses in 2011, which was 75 per cent more than in 2010. As of February 28 this year, 120 premises were involved and experts forecast that this will only increase. Although unlicensed guesthouses are less expensive than licensed hotels, they pose potential health and safety risks. Jennifer Chow Kit-bing, an Eastern District councilor, said private residents had complained to her office about security concerns. “Residents have reported that strangers with luggage enter their residential building using entrance keys or the security code. They suspect that some flats are operating as illegal hostels, and feel insecure as different people are coming in every day and invading the residential area,” said Chow. Mr Chan, who has been living in Man Wah Sun Chuen for more than 20 years, has seen a growing number of strangers entering his building. Unlicensed guesthouses also pose safety issues such as fires. 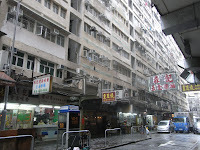 In 2009, a fire broke out at the Hai Phong Mansion in Tsim Sha Tsui, and a tourist died of smoke inhalation. Authorities later found that the tourist was staying in an unlicensed guesthouse. "Unlicensed guesthouses have not been inspected, so they may not comply with structural and fire safety standards in the building and fire services ordinances. 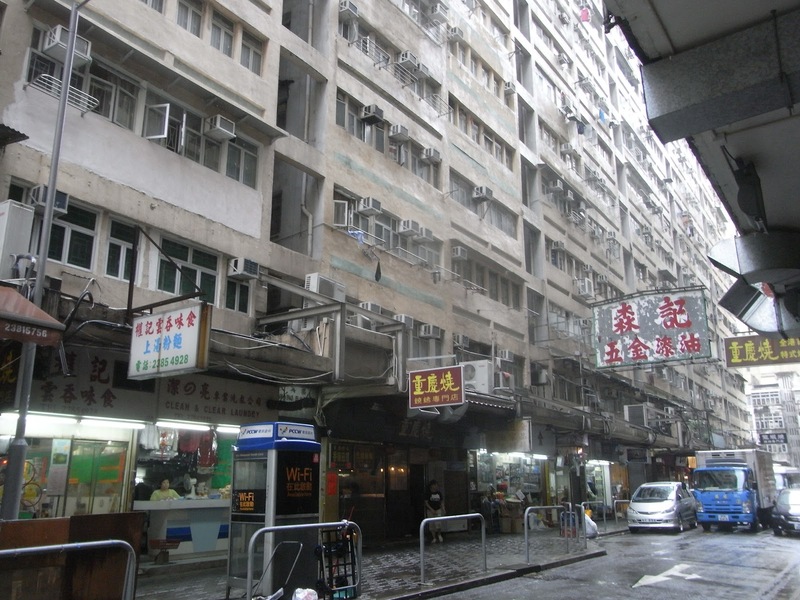 People’s safety in these buildings are at risk,” said Yu Tak-cheung, chief officer of the Licensing Authority. The OLA will carry out stringent inspections and step up publicity, Yu said. To better understand how an unlicensed guesthouse can put visitors’ lives at risk, I went undercover as a renter. First, I went online and searched for accomodations. On the Hong Kong Suite Apartment’s website, I called Carlson, who identified himself as a Taiwanese and the flat owner, and I asked how much a room would cost for five nights. He showed me a flat in Man Wah Sun Chuen, and wanted to confirm my booking with a HK$3,100 rental fee and a HK$1,000 deposit. He also gave me the number for Teresita, who would help me check in. On check-in day, I met Teresita on the ground floor of the Man King Building. “Here is the security code of the building, and you are staying on the 18th floor. The highest level that the lift can reach is the 16th floor, so you need to walk up two floors.” she said. Even though it was early in the morning, the staircase was dim and slippery on the way up. When I entered the 200 square foot space on the 18th floor, I saw a tiny living room with a television. On the right, there was a double bed, and on the left a kitchenette with an induction hotplate and microwave oven. The 25 square foot bathroom had a shower, but even when the exhaust fan was turned on the smell of urine and garbage was strong. The shower floor was also littered with dead bugs. Even though the interior is adequately furnished and appeared tidy and clean, the common areas, such as the staircase and the corridor, are dark and dimly lit. And giving guests the building’s security code puts the safety of private residents at risk. At the end of this experience, I learned a valuable lesson. 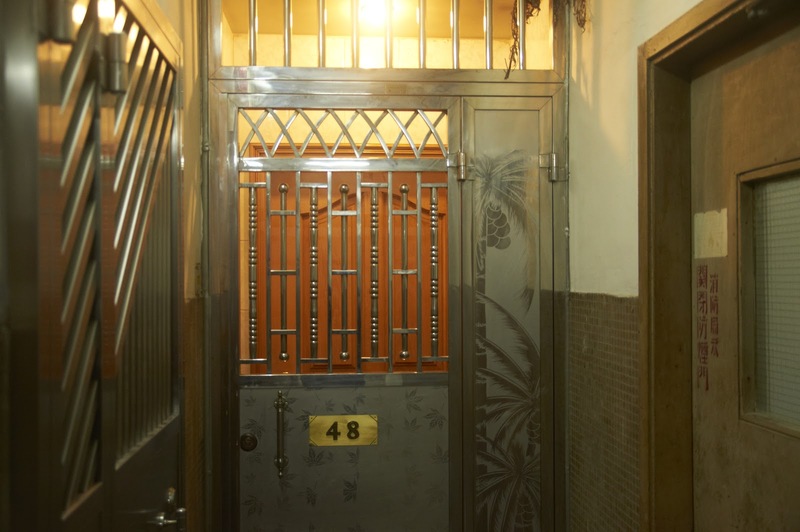 The pictures posted online of these guesthouses should always be double checked in person. It was only when I witnessed first-hand what these unlicensed guesthouses were like did I truly understand their potential dangers, and why they are a blemish on Hong Kong’s reputation as an international city. 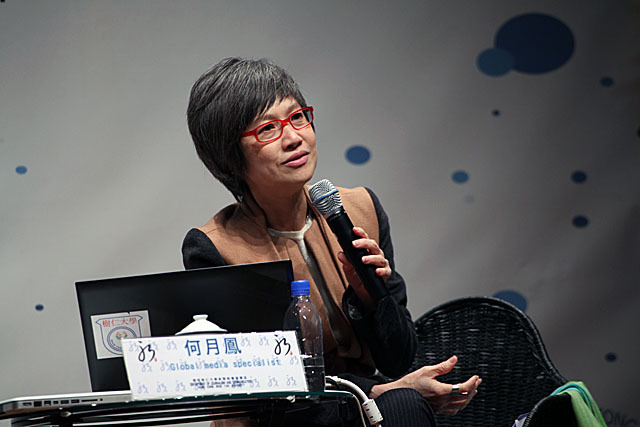 Recent restrictions commenced by State Administration of Radio, Film and Television (SARFT) on broadcasting of television programs have put constraints on television program production and had a great impact on both Hong Kong and Taiwan TV stars, said experienced television program producer Ng Yu. In July 2011, the SARFT initiated a policy to limit the number of entertainment programs, such as reality shows or contests program, to be aired on television. According to the policy, satellite TV should not broadcast more than two entertaining program per week, and the length of each show should not exceed 90 minutes. SARFT further extended their restrictions on broadcasting media this past January. They expressed disapproval of time-travel television drama which often involve a modern-day protagonist propels back into a dynastic era, and stated that at least half of satellite television dramas must be set in the modern day. Ng believes that these policies put constraints on the creation and production of television programs. “Before the commence of the policy, there were already many cases where television programs were forced to stop broadcasting as they have created a stir within the public, or being widely discussed among the public,” said Ng. 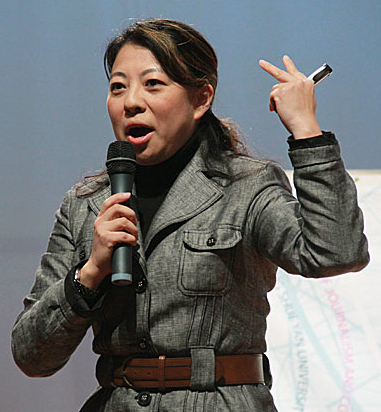 Ng said that these polices restricted program producers’ creativity, and “these policy would make the situation worse as they limited the freedom in non-political related programs”. “Many Hong Kong and Taiwan artists participated actively in the mainland’s broadcasting media industry and gained much popularity among the audience in China. These policies restricted the types of program to be aired, and put to a halt to Hong Kong and Taiwan artists’ participation in the Mainland television industry,” said Ng. 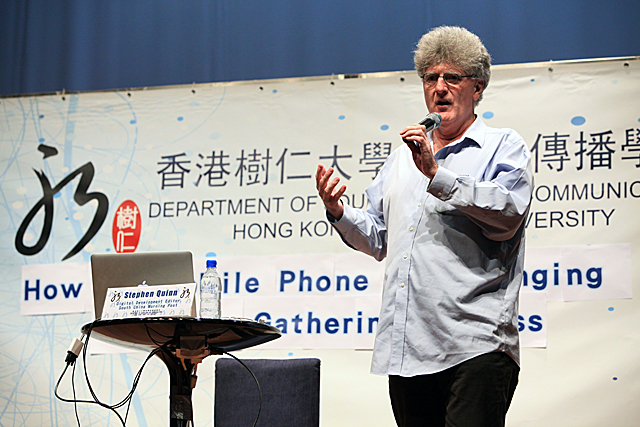 The uprising of mobile journalism contributes lots to media industry, yet at the same time brings threats to the industry, said Stephen Quinn, Digital Development Editor at South China Morning Post. Quinn said that the influx of smartphones and new mobile network plans bring convenience to journalists, as journalists nowadays can simply complete their reporting with the all-in-one device in their hand. “Journalists in the past used to do their live broadcasting with many devices such as the hand-held cameras, microphones, and notepad. There’s no doubt that journalists benefited from the invention of all-in-one cellphone as they no longer need to have many equipment in hand at a time. This also greatly reduced the cost of journalism,” said Quinn. He said the mobility of journalism increased due to the uprising of mobile journalism. “Reporters can do their reporting immediately if they see big news happening around, and they can post their news story to the web immediately, spreading the news at a faster pace,” said Quinn. Quinn pointed out that mobility of journalism is a double edged sword as it not only bring benefits and at the same time causes threats to individual privacies. “You have no idea when you will be filmed by others. There have been cases where people in public were being recorded in videos and posted online. Laws concerning privacy definitely require revision so as to protect citizens’ privacy in a better way.” said Quinn. 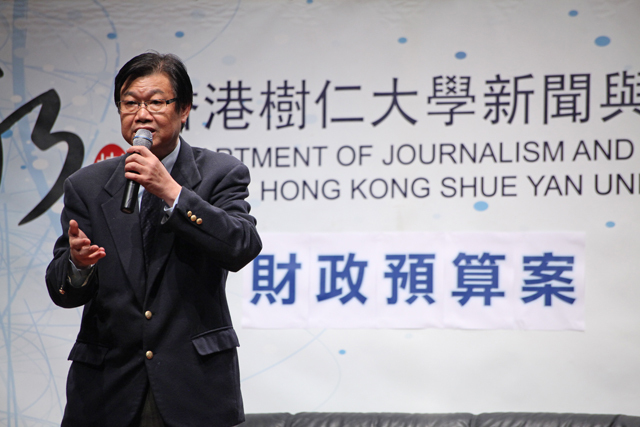 Hong Kong Government should continue improving local population policy, public’s engagement as well as working on a common goal for Hong Kong citizens, said former Secretary for Security Peter Lai. Peter Lai pointed out that population policy has great impact on society, and it is of paramount importance for both the existing and future government to optimize it. “Birth rate in Hong Kong has been increasing, yet most of these newborns’ parents are not Hong Kong citizens but rather mainland Chinese. This causes a heavy burden on local welfare and we definitely need to find a way out,” said Lai. “Even though there are several channels provided to citizens to voice their opinions, efforts are still needed in encouraging them to tell us what they are thinking,” said Lai. He believes that the government could only draft and implement a policy smoothly if it has taken everyone into account, which means opinion from the publics should be taken into consideration. “Hong Kong will have a bright future only when we, the Hong Kong citizens, have developed a common goal, and pledge to work to reach the goal,” said Lai. There are over 1.26 million people living in poverty in Hong Kong, and we definitely need more donations, said The Community Chest Community Relations Manager Louie Hang-shan Tong yesterday. Tong said that there are many needy in Hong Kong and The Community Chest subsidize their member social welfare agencies with the funds they have in order to help all those people in need. “We currently have over 150 member social welfare agencies, which include the Hong Kong Red Cross, Caritas Hong Kong, and Salvation Army etc. They cover around 2,360 service spots in Hong Kong, and this enables them to reach millions of people in need,” said Tong. Henry Tang Ying-yen pressed ahead with his election campaign and submitted 379 nominations to the Election Committee for the Chief Executive election last week, despite the latest report of marital infidelity and illegal structures. Tang's public relations representatives handled the issues poorly, but that's understandable since many local PR practitioners are unfamiliar with confronting politicians' PR duties, said experienced media specialist Lai Man-cheuk yesterday. 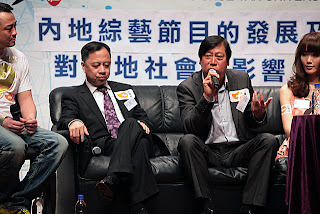 Lai commented that Tang's public relations representatives have handled the crises ineptly, yet he believes that they should not be blamed since the locals are relatively green to the current political environment. "Tang's PR failed in managing crises and causes Tang's integrity to be further questioned by the public. However, it is understandable for the poor management since the local political environment is still immature, and it is expected that people are not familiar with political tricks," said Lai. Lai believes that the key to successful crisis management is the maximization of "time and space". "All crises bring loss. What we should do is to lengthen the time we have and try to solve the problems with a clear mind. No matter what tactics were used to deal with the issues, honesty is always of paramount importance," said Lai. Lai further explained, "No matter under what circumstances, people should think of the consequences of every act when their dealing with crisis. 'Blaming Tang's wife' is definitely not a good way in dealing with Tang's cases. The PR representatives should aim at minimizing the loss brought by the cases, as well as upholding the reputation of Tang at the same time." Lai said that the immaturity of local political environment brought constrains to Tang's PR in handling political crisis. He continued, "In the contrary, Taiwan's President Election in mid-Jan this year was mature. It is not hard to notice the evolution of their political environment. It is possible that one day, Hong Kong could establish a fair, open and mature political environment. Under such circumstances, PR practitioners would be given a more favorable environment." Newcomers could end the duopoly long held by two major TV stations and bring positive impacts to current market, said former CBS Managing Director Ho Yuet-fung. Rapid development of technologies has forced many industries to reshape themselves. 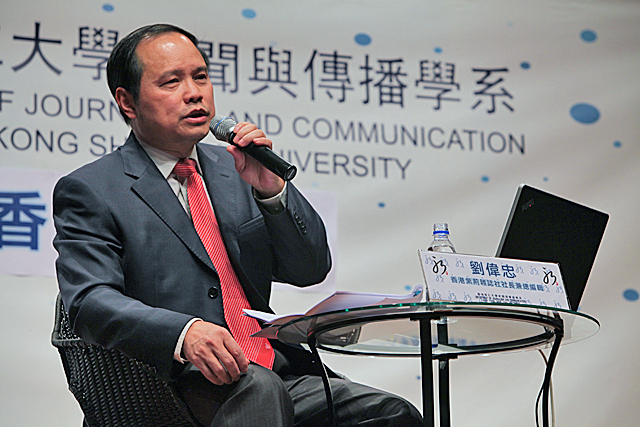 Invention of the internet has pitched the television broadcasting industry to a new era and practitioners must try hard to catch up, former Managing Director of the CBS Broadcasting International Asia Inc. Ho Yuet- Fung said yesterday. The internet has been commonly used by individual users since 90s as free web rowers were introduced. Since then, behaviors and habits of audiences have changed. 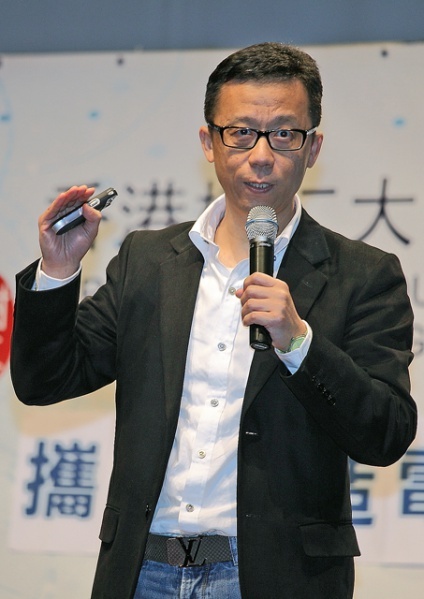 “Practitioners are now harder to control their audiences, they need to catch up quickly in order to keep themselves survive,” said Ho. Since technologies develop rapidly, the cost of film making and TV drama production has been lowered. Individual users can produce their own programme and distribute through their own channels. “Everyone can make their own website and produce their own programmes; everyone can be the host as well as the promoter,” said Ho. “Television stations can no longer monopolize the market. More and more people are producing their own drama and movies, and these productions do receive high click rates and gain lots of audiences,” said Ho. 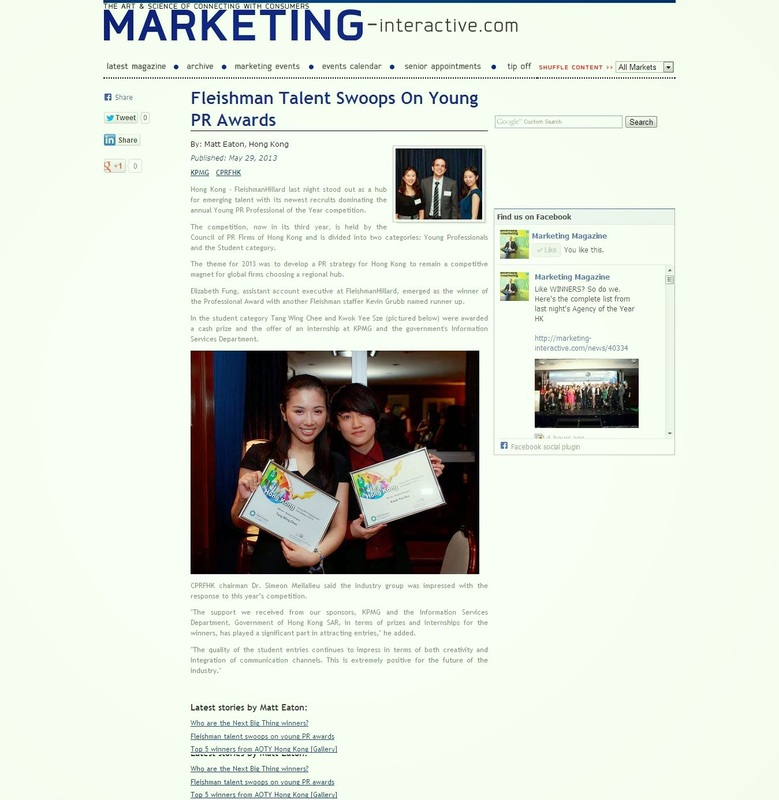 Ho believes that talents are everywhere and competition is keen in current market. “Look at those online TV websites, look at YouTube. One doesn’t need to work under big corporations in order to reach its audiences. Practitioners need to put more efforts in creating contents, the resources and supports from corporation are no longer the advantages that they can reply on,” said Ho. Ho regards the entrance of new comers beneficial to the market as this creates a positive competition. She urges current producers to focus on the creation of scripts and programme contents in order to keep themselves survive. The 2012/13 Budget has been under criticism since it was delivered by Financial Secretary John Tsang last Wednesday. Though the budget may have doled out sweeteners to different parties, it lacks long-term vision and creativity, an experienced financial commentator said yesterday. The fiscal budget announced last Wednesday includes a variety of relief measures to help the middle class and small and medium enterprises (SMEs) which worth approximately HKD 80 billion. The dishing out of sweeteners is welcomed by citizens, yet experienced financial commentator Chiu Sun Chun doubts the effectiveness of such handout. “These one-off relief measures wouldn’t help much, they could only ease the pressure of residents and business during this hard time, yet Hong Kong’s deep-rooted problems remain unsolved,” said Chiu. 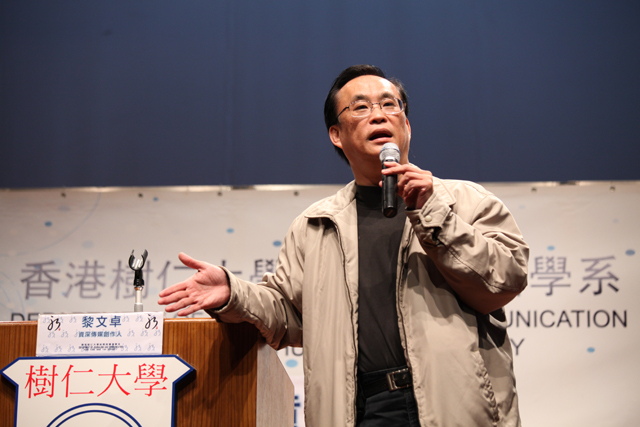 Chiu pointed out that many problems were deeply seated in Hong Kong. The budget should not only put its main focus on solving short-term issues, but also seek for solutions in dealing with those inherent problems. “Making through the worsening economic condition is of paramount importance, what the government should do is to find ways to fuel our economic growth. The budget is way too conservative and short-sighted. The government should set up more research and development projects so to establish new industries that will boost our economy and solve the deep-rooted problems,” Chiu said. 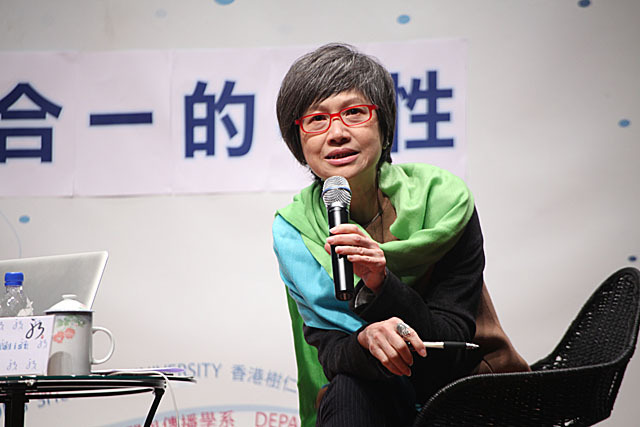 Chiu commented that the fiscal budgets announced before 1997, when Hong Kong was still a British colony, consist of long-term visions and plans which truly helped the city’s development. However, as Hong Kong was returned to China by the British, policies and budgets have become more short-sighted and conventional. As the government will soon be handed over to the next Chief Executive, Chiu hopes that Hong Kong could become more vibrant city under the leadership of the new cabinet. Equality has always been one of the core values of Hong Kong society, yet retired Cardinal Joseph Zen Ze-Kiun pointed out that the goodness has gone. He believes that racism is still of major concern, “it’s pathetic to witness the changes in Hong Kong, especially when it comes to fighting against human right and equality. Discrimination still exists, no matter how civilized Hong Kong society is,” said Cardinal Zen. He expressed his concerns over the fight for domestic helper’s right of abode, and he believed that the Government should grant them the right without any hesitation. Cardinal Zen was the sixth Bishop of Hong Kong and was elevated to cardinalate in 2006. He has done a lot in fighting for human rights, political freedom and religious liberty, and his sacrifices are widely recognized. “Generosity and equality have always been the core values of the Catholic Church. God made people in His image, and no one should be discriminated against,” said Cardinal Zen. “The selfishness of Hong Kong government could apparently be seen. Government tried to take away their right, and this is obviously an unfair and discriminating act. Domestic helpers should be offered help and care from society,” said Cardinal Zen. He also believes that even some of these domestic helpers need to apply for the government’s Comprehensive Social Security Assurance, it’s still reasonable and the government should approve the application without hesitation. Cardinal Zen considered the application on interpretation of law from Standing Committee of the National People’s Congress on right of abode in Hong Kong unreasonable. “The Basic Law stated that the Court of Final Appeal is the only court that could do the application. Such application on such issue is destructing both the judiciary system and its dependence in Hong Kong, which is in fact the core value of the one-country-two-system,” he said. He expressed his concerns over the future of Hong Kong society, and he stressed that unless the Government goes back on to the right track, society’s future is in doubt. 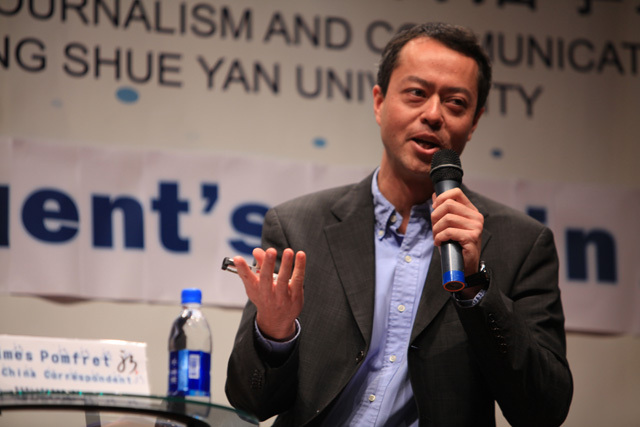 After working as a presenter in television and radio stations, James Pomfret settled down in Reuters as a correspondent located in mainland China. 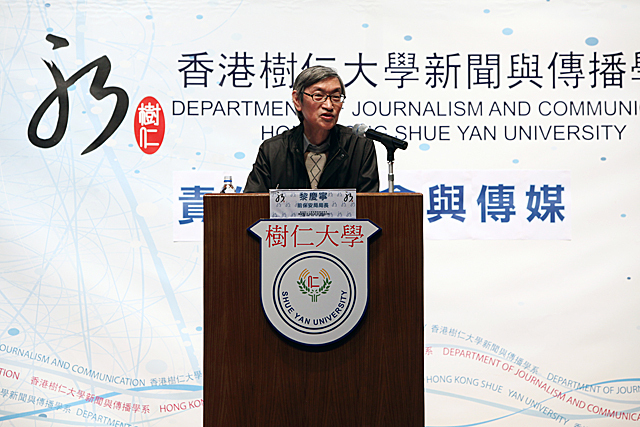 He shared his valuable experiences with the journalism students at Hong Kong Shue Yan University earlier today, hoping that students would have passion for the industry, seek truth and tell the facts no matter under what circumstances. James Pomfret was graduated from Southampton University in the U.K., and like many other journalism graduates, he pursued his career in the media industry. Pomfret has a multimedia background in television and radio, and in 2006, he settled down in Reuters as a foreign correspondent. Over the past years, Pomfret has reported on numerous major issues, which include the SARS outbreak in Hong Kong, the 2008 Olympic Game, South Korea World Cup, and the G20 Summit. Pomfret believes that the role of a correspondent is very comprehensive and challenging. “We are not writing for local readers, but rather an international audience. We have to take every detail into account and put sufficient information in our story, so as to let our audience to know what’s happening on the other side of the planet,” Pomfret said. Pomfret further revealed that the correspondent position requires a higher standard when compare with that of local media reporters. “Typically, for breaking news, we have to finish writing our story in 15 minutes, and in fact the editors mostly require an even higher speed. The pace is really fast and we have to work under lots of pressure,” he said. Over these years, Pomfret has worked on different investigative reporting. One of his major piece is an investigative report on the topic “forced abortion in Guangzhou, China”, where he visited victims on the ground. He encouraged those wanna be journalists-wanna-be to go out and perform interviews on their own rather than relying on online information. 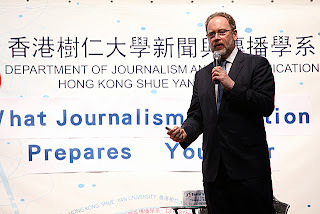 Pomfret expressed his views on the press freedom in Hong Kong and that in China, “Hong Kong is a very special place, since we have media freedom, it’s not like china, and we have less restriction here. But we should never take this for granted. Not every country or city has such a privilege,” said Pomfret. Born and raised in Hong Kong, Jennifer is an English-Cantonese-Mandarin trilingual speaker. She holds a Bachelor of Arts (Hons) in Journalism and Mass Communication and has keen interest in public relations industry. She currently serves as Management Trainee (Retail Banking and Wealth Management) for Hang Seng Bank Limited (HKSE: 0011.HK). Jennifer Tang. Awesome Inc. theme. Theme images by mattjeacock. Powered by Blogger.